Happy New Year CompSust researchers! 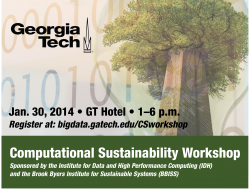 If you are in the Atlanta area take a look at this workshop being hosted by Georgia Tech. It looks like a good opportunity to build local awareness and community for CompSust problems and solutions. Sustainability starts with the individual and extends to buildings, neighborhoods, cities, and regions. Workshop participants will simultaneously explore new approaches to achieving sustainable growth that can be enabled through innovations in computation, as well as the computational technologies themselves. Relevant computational technologies include data analytics, modeling and simulation, optimization, high performance computing, and distributed computing platforms. The event will include a brief overview to frame the discussion, a series of representative presentations covering ongoing research in sustainability challenges and computational technologies, breakout discussions to define overarching themes and synergies, and a networking reception to enable further discussion among researchers. While time does not permit everyone to give a formal presentation, discussion sessions are included to enable others to briefly discuss their research interests.